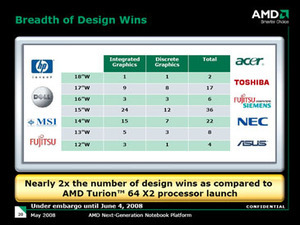 AMD has introduced its Puma notebook platform and announced the availability of products based on the platform at a press conference in Taipei city today. “There are only two companies in the world that can build and deliver high-performance microprocessors and there are only two companies in the world that can build and deliver high-performance graphics solutions. 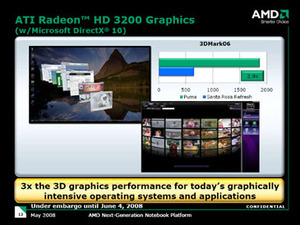 Only AMD can do both,” said Dirk Meyer, president and COO of AMD. 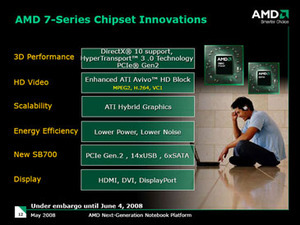 Puma is based on AMD’s M780G chipset, which is very similar to the desktop version that launched earlier this year – it includes the same technologies that were in 780G, such as Hybrid CrossFireX, ATI’s UVD engine and Avivo. 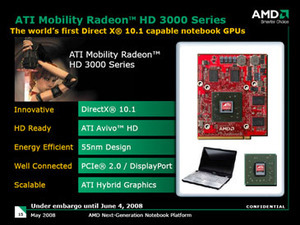 In addition to that, AMD has integrated a technology known as PowerXpress – this allows notebook manufacturers to include a Mobility Radeon 3000-series graphics card and it’s only running when it’s required. We’ve seen demos of this technology working on some early development notebooks and we have to say it was pretty impressive. 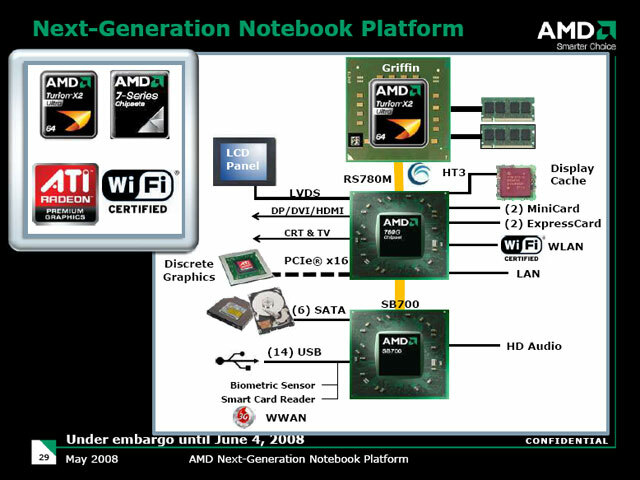 As soon as you unplug the notebook’s power supply, a driver window pops up and warns you that the discrete graphics adapter will be disabled. The switch isn’t quite perfect because the screen flickers a little when you’re changing from discrete to integrated graphics, but it’s automatic and that is what is most important in our opinion. 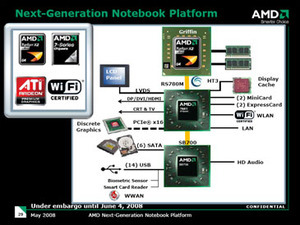 That’s not all though, because AMD has also introduced a new technology known as ATI XGP Technology, which enables gamers to enjoy gaming on the go on small notebooks that you wouldn’t normally associate with gaming. 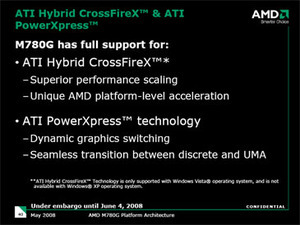 ATI XGP Technology works in much the same way as the Asus XG Station, although this time it runs over a dedicated PCI-Express x16 interface instead of via ExpressCard (PCI-Express x1). 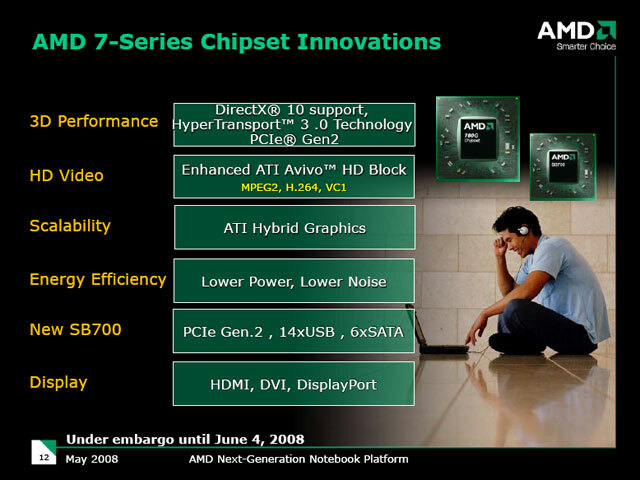 We’ll be having a closer look at some of these technologies over the next few weeks, so stay tuned for more soon! In the meantime, you can discuss these announcements in the forums. 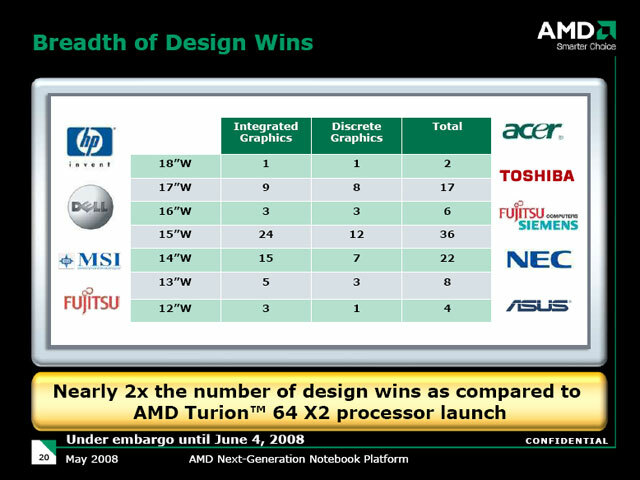 Addendum 10th June 2008: AMD now has a (marketing) video to complement its Turion X2 Ultra launch here.